In the 1840s, Dutch and German immigrants farmed this land near Milwaukee County’s northern limit. In 1885, the site was acquired by three brothers of the Uihlein family, owners of the Schlitz Brewing Company. In 1887, they deeded the property to the brewery and it became the Nine Mile Farm, named for its distance from Wisconsin Avenue. Here draft horses were bred and footsore brewery horses were brought to rest. Resident caretakers raised dairy cattle and poultry, and intensive planting of evergreen seedlings began about 1910. In 1969, when the Schlitz Foundation considered disposing of the farm, its future became a controversial issue. Bayside residents opposed its development into a residential or shopping center and organized to urge preservation of the 185-acre natural habitat. As a result the property was offered to the National Audubon Society for the creation of a nature center. The Uihlein family and others donated sufficient funds for the center’s development. An interpretive center designed by Milwaukee architect Fitzhugh Scott was opened in 1974. The Dorothy K. Vallier Environmental Learning Center opened to the public in May 2003 and is one of the most environmentally sensitive buildings in the nation. This tile-roofed house was constructed in 1912 in the “Mediterranean” style. It is representative of the changing social patterns of residential housing in the 20th century. House plans were developed and drawn by Hugo C. Haeuser, a noted Milwaukee architect. He was apparently influenced by the Italian Renaissance Revival which is underscored by the presence of wide tile loggia running across the front of the house. The exterior walls are stucco. The central part of the loggia was marked by a veranda open to the lake. The first alteration was made in 1939-40 for Louis R. Taylor, the original owner and builder. The veranda was enclosed and finished off to be part of the house. The rear walls of the adjoining rooms (dining and family rooms) were extended slightly to present a unified appearance with the former veranda. A fireplace and chimney were added, the basement recreation room size was doubled and a fireplace added, a “vegetable room” was added under the front hall and other improvements were made to the kitchen, breakfast nook, heating plant and bathrooms. Although this country home on the bluff overlooking Lake Michigan was eventually converted to a year-round residence, the front façade and essential floor plan of the house remain unchanged except for the addition of a terrace and expanded garage at the north end in 1975 and a conservatory in 1994. This modest stone gazebo (still standing) on the west side of Lake Drive a few blocks south of the entrance to South Fairy Chasm was called the “Entrance to the Alps.” It is symbolic of efforts to develop this area to provide recreational enjoyment of its natural beauty. The gate was the starting point for nature walks through the adjoining ravines, highlighted by man-made interpretive features. At the turn of the century, Jake Donges and Fred Usinger developed the area north of the “lion gates.” The former Fish Creek Ravine was renamed Fairy Chasm. Picnickers would present a ticket at the “gate” and follow a winding path about two miles through the “Fairy Chasm” to the mouth of Fish Creek and a sandy beach on Lake Michigan. The paths were well maintained, rare trees were planted and labels for the trees were installed as well as other signs with snatches of poetry. As late as 1925 and for a few years thereafter, those paths were still serviceable. At exceptionally good outlook points, benches had been built and signs posted to name the various views. The Fairy Chasm Gate was built in the same pebble and mortar construction as the “lion gates” at the corner of Fairy Chasm Road and Lake Drive. Mr. Donges acquired all sorts of relics and installed them on his expansive estate on North Lake Drive south of the county line. There was a statue of an Indian shielding his eyes with one hand that Mr. Donges erected in the ravine. The base of the statue is inscribed “Hiawatha looking for Minnehaha.” Another statue was of Justice blindfolded and holding a pair of scales that had adorned the dome of the Milwaukee County Courthouse on Jackson and Kilbourn Avenues. An imposing fieldstone wall was built at the entrance to the south tract, with two beautiful ironwork gates that were kept closed. The two leaves of the gate at the entrance to the south tract bore the initials “F” and “C” which originally stood for “Fish Creek” but later they identified “Fairy Chasm,” the new name of the area. The fieldstone entrance with its ornamental iron gate defined the entry to South Fairy Chasm until 1941 when it was demolished by a careless driver. The stone walls were later removed and replaced with an iron fence. That fence, also equipped with usable gates, suffered the same fate as its predecessor and was replaced with the present entrance. 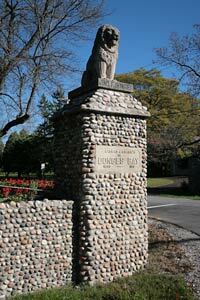 The Lion Gates were constructed in 1911 by Jacob Donges and Frederick Usinger to mark the entrance to their estates. The gates were constructed of stone hauled up to the site from the Lake Michigan shoreline by horse and wagon. The work took a crew of six to eight craftsmen a year to complete. When the stone walls were completed, they were topped by carvings of lions which bore the names of Donges and Usinger. The Donges lion is inscribed “Gardens and Chasm’s in Donges Bay 1890 – 1911.” The Usinger lion is inscribed “Country Life in Donges Bay 1890 – 1911.” Eventually, the Donges and Usinger estates were subdivided and South Fairy Chasm was annexed to the Village of Bayside. In 1983, cracks in the stone walls were repaired in order to preserve the entrance gates. Today, the Lion Gates are maintained by the Village of Bayside. The Lake Drive Lion Gates in Bayside were designated official Milwaukee County Landmarks in recognition of their historic significance.